mainly macro: Search in the goods market? Search in the goods market? Imagine an economy made up of independent producers, who individually produce some good. Producers each have a fixed ‘capacity’ k of the output they produce. Producers are also consumers, but cannot consume their own good. Instead they search for other goods by visiting other producers. Agents as consumers have a certain demand for goods, which will depend on how much of their own good they sell, as well as some initial endowment of money and the price of goods in terms of money. Traditionally we ignore the costs for consumers of visiting producers, and we assume that any visit will result in a purchase. As a result, for a given price level, we can have three situations. In the first, aggregate consumption demand is below aggregate capacity (the sum of all k), and producers end up with either unsold goods or idle capacity. In the second, aggregate demand is equal to supply. In the third, aggregate demand is above capacity. In this case we must have rationing of goods. In this framework output is not always determined by aggregate demand, but only up to some limit. This is not how macroeconomic models typically work - they generally assume output is always equal to aggregate demand. The way New Keynesian models justify this is by assuming that producers can produce above ‘capacity’ (or that they prefer to always have some spare capacity), and that they will be happy to produce above capacity at a given price because they are monopolistic. A recent paper by Pascal Michaillat and Emmanuel Saez applies the framework of search to the goods market. First, each visit by the consumer is costly (visiting costs) - some of the produced good is ‘lost’ (does not increase utility) as a result. So output (y, the sum of all trades) is greater than consumption (c) because of these visiting costs. Second, a visit may not lead to a trade. Whether it does depends on a matching function, which depends on the ‘tightness’ of the goods market = x, defined as the ratio of visits to capacity. Here is a diagram from their paper. The consumption demand line is downward sloping, because a larger number of visits raises the effective price of the produced good. The output line is upward sloping, because more visits result in more trade, but the matching function is such that it gets steeper with more visits. However if visiting costs are linear in visits, that implies what the paper calls ‘consumption supply’ has this rather odd shape. (Think about the constant capital line in the Ramsey model.) For a given price, the intersection of the consumption demand and supply lines defines equilibrium tightness. Perhaps a simpler way of putting it is that consumers plan the number of visits they need to make given their consumption demand schedule. Now shift the consumption demand line outwards, by reducing the price. (In a New Keynesian framework, think about the price as the real interest rate.) The line pivots about the xm point, but output always stays below k. As tightness (number of visits) increases, more resources are used up in failed endeavours to make a trade, and consumption starts falling. Output is always ‘demand determined’, and there is no rationing. It is still possible to think about different ‘regimes’, because the efficient level of tightness is where consumption is at a maximum. If tightness is below that point, we can say that demand is too low (the price level is too high), and vice versa. Those familiar with matching models in the labour market will see the connections. Visits are equivalent to vacancies, for example. The key question is whether this transposition to the goods market makes sense, and what it achieves. To quote the authors: “casual observation suggests that a significant share of visits do not generate a trade. At a restaurant, a consumer sometimes need[s] to walk away because no tables are available or the queue is too long.” (What is it with economists and restaurants?!) We could add that this rarely means that consumption is rationed - instead the consumer attempts to make a similar trade at another restaurant. However this does have an opportunity cost, which this model captures. In a subsequent post, I will look at their full model which has separate goods and labour markets, and the various types of unemployment that this can generate. Those that cannot wait can read their own account on Vox. Could you tell the authors that Google invented the search engine with a built-in tool for "shopping" reducing the "visit" requirement to one, if not zero with free delivery. Restaurants can be booked in the field by mobile telephone, using voice; text messaging or proprietary software applications. I think the key point is this. How often do you find that the good you want to buy is 'out of stock', AND as a result you decide to reduce your consumption and save more? If that happens, then you are being rationed. What this paper suggests is that you are more likely to look elsewhere for a similar good, which of course incurs costs whatever the technology. A third possibility is that rationing does not occur for some other reason. To put it another way, is it right to assume that output is always equal to aggregate demand, and if so, why. Output never equals aggregate demand, except by accident; that's why Accountants invented the word "inventory". 'If You Build It, They Will Come', may have worked for Kevin Costner but try getting a start-up bank loan with that line. Simon, stop messing about with this stuff and concentrate on the "Productivity Conundrum". Particularly, is public sector capital investment essential to promote private sector productivity? And I am afraid that the model you cite is another (neo-)classic example. In their attempt to ensure that Say's law does not automatically hold, Michaillat and Saez try to include something that is supposed to be money (nonproduced goods). But since these are endowed, their price can only be determined in subsequent exchange. 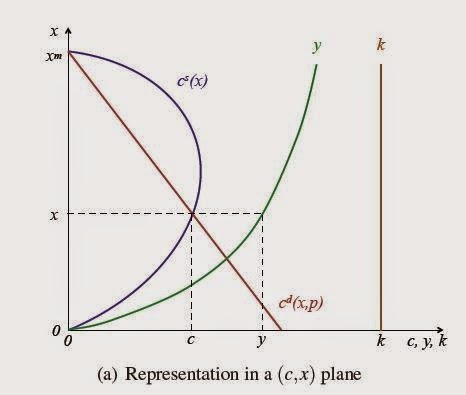 Yet the authors need the price of these goods to be a numeraire or else the equilibrium price in the model is not an absolute price but a relative price that leaves aggregate quantities indeterminate. Something has to give! An economy with only relative prices is a barter economy in which Say's Law will indeed hold - which we can make sense of by regarding the search here as an additional cost of production which we are 'employed' to deal with! A true monetary model is required to give us genuine insight into unemployment and this needs to actually model monetary institutions realistically. Even the BofE seem to have got the message as to what this entails! See http://www.bankofengland.co.uk/publications/documents/quarterlybulletin/2014/qb14q1prereleasemoneycreation.pdf Let's hope they start applying this insight. My reaction to your comment is that you are taking a (rather old-fashioned) modelling device too seriously. The old fashioned neoclassical synthesis had aggregate demand as a function of M/p, so there was some p (or some M) that allowed aggregate demand to go to its efficient level. A more modern approach would be a New Keynesian framework where there was some real interest rate that achieved the same result. Would you have similar objections to this? Thanks for your response, Simon. If the real interest rate is simply the price of a financial asset in terms of real goods and services, then we are faced with a subtly different problem, although with the same result of a lack of an adequate account of demand shortfalls. Unless we have some explanation for the financial asset being valued prior to exchange, then why should it be accepted in exchange other than by assumption? If by assumption, then we are ruling out a priori any role for the mechanism of creation and valuation of the financial asset in the formation of demand (and supply). And if the view of money explained in the BofE QB article cited is anywhere near correct, this is unacceptable.